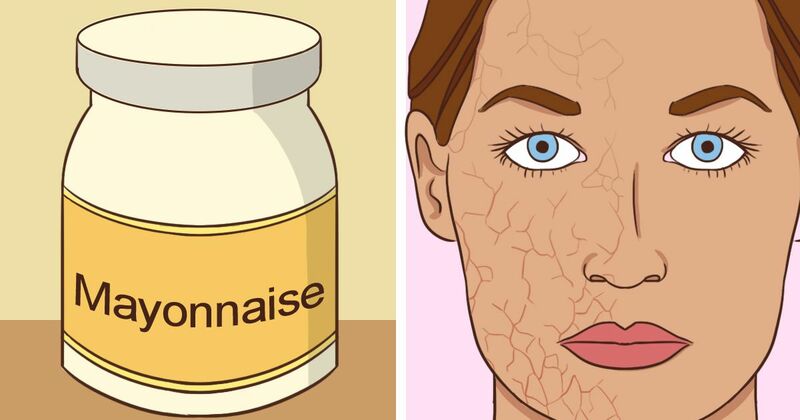 Is dry skin causing you problems? Not to worry, according to Web MD, dry skin is not necessarily the sign of a bigger issue. Sometimes dry skin, is well, just dry skin. However, there is a number of contributing factors such as sun exposure, natural aging, and even your diet. There are a ton of over-the-counter creams that are available for purchase, but sometimes those options can cause even more problems, especially for people who have sensitive skin. Let’s take a look at some of the tried and true natural methods that some people have said helped improve their dry skin. Most of these things you’ll find in your cupboard. Read on to learn more. According to an article from beautymunsta, mayonnaise is rich in eggs and oils. This is like a dream come true for your skin! The natural hydrating properties help to preserve moisture in your dry skin cells. It only takes one tablespoon of mayonnaise left on your skin for ten minutes to make it soft and smooth. Is your skin scaly and itchy? Milk will do the trick. An article from Treehugger indicates that milk is an excellent resource for nourishing your skin because it has anti-inflammatory properties that can help soothe itchy, dry skin. To use, dab a washcloth in milk and blot on your skin. Allow it to set for five minutes before rinsing away. Just like that, your skin is on its way to repair! If your skin is severely dry then drinking water could help. However, an article from Prevention warns that drinking water should not be substituted for applying a good moisturizer. An article from Prevention indicates that slathering your skin in shortening and covering it overnight will moisturize your skin. To prep your skin, you should soak in a warm bath until you are pruned. Be sure to cover your skin with socks and pajamas to reduce the mess in your bed! Treehugger reminds us of the benefits of honey. Not only does it work to cleanse the skin of harmful bacteria, but the soothing properties help repair damaged skin. Honey can also work as a moisturizer. Apply raw honey to the troubled area and allow it to settle for five to ten minutes before removing. Oatmeal works as a gentle exfoliate. A buildup of dead skin cells on the skin can block the skin from getting proper moisture. Mix a few tablespoons of oatmeal with enough water to make a paste. Rub it on your skin to gently remove the dry cells. The fatty acids and vitamins found in avocado can replenish skin. According to Top 10 Home Remedies, the high Vitamin A content helps restore the skin and keep it silky smooth. Simply crush up an avocado, apply it to your skin and all it to set for five to ten minutes. This is such a mild method that it can be used daily. Yogurt is packed full of benefits for your skin. Top 10 Home Remedies says that yogurt has anti-inflammatory properties that relieve dry skin. Plus, the lactic acid works to remove germs and bacteria that can cause dry skin. You can cover your face, hands, and feet with yogurt and allow it to set 10 minutes before washing away. Coconut oil works to gently moisturize skin. Top 10 Home Remedies indicates that coconut is useful because of the fatty acids. Apply liberally to your skin and allow it to settle overnight before washing way in the morning. Your skin will feel soft and smooth. Aloe vera works to soothe dry and damaged skin. Top 10 Home Remedies indicates that the anti-fungal and antiseptic properties work to repair damaged skin and coating your skin in the thick gel will provide a layer of protection. Don’t suffer from dry skin! Try out one of these natural remedies today. Share with your friends to see what works for them.